You are here: Home / Solutions / Fri3Oil System WAT! The R&AC Circuits Cleaning system. Exclusive Patent ownership by RefriApp. Today, there is a major problem in the refrigeration and air conditioning industry due to the hygroscopicity of the polyol ester oils, POE, which are used with HFCs. These oils take humidity from the ambient, becoming acidic. 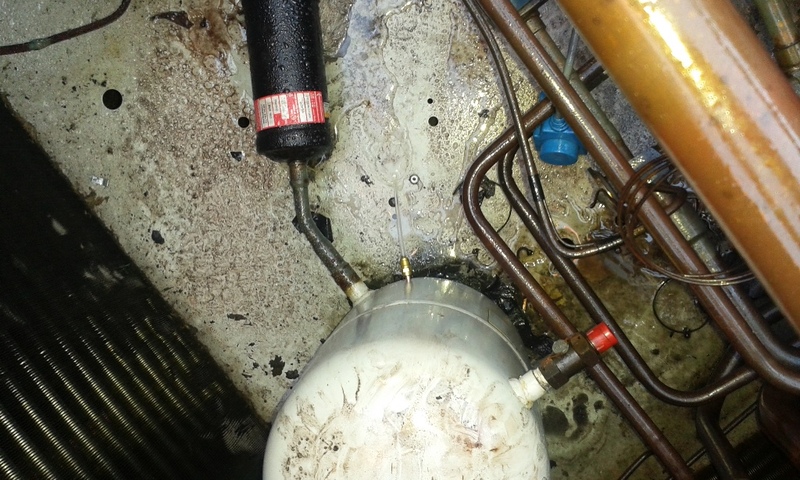 This acidity will harm the compressor and other parts of the installation. 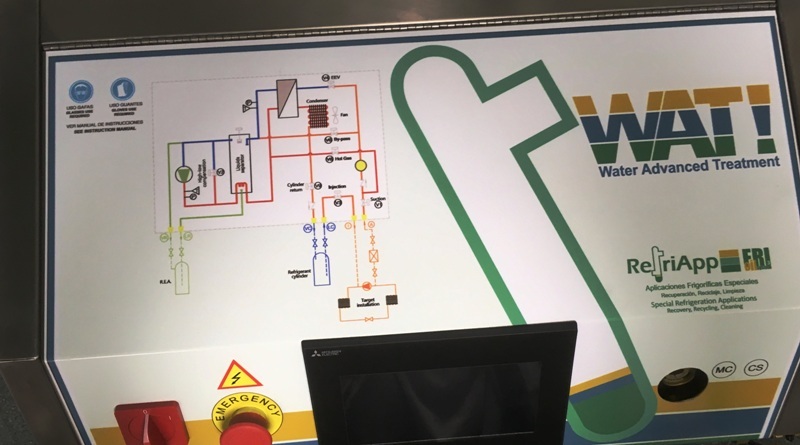 Using the existing system refrigerant for cleansing without any need for other consumables / cleaning agents, that might otherwise be harmful to the refrigeration plant, Fri3Oil System WAT! allows oils, acids, water and other substances removal of any R&AC system. Fri3Oil System WAT! is environmentally friendly, since it “recycles” refrigerants, avoiding their incineration. Fri3Oil recovers and recycles refrigerant from equipment destined for decommissioning/destruction, without any refrigerant emissions. Fri3Oil System WAT! 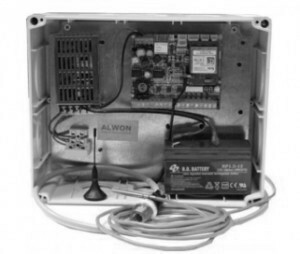 is the only automatic R&AC circuits cleaning system Worldwide 100% effective. 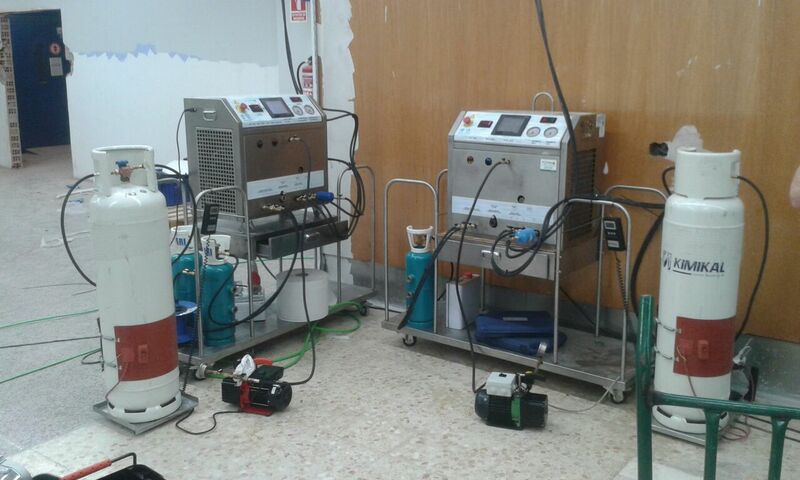 Fri3Oil System is able to extract the acids, generated by POE oils, water and impurities generated within the system. Fri3Oil System WAT! 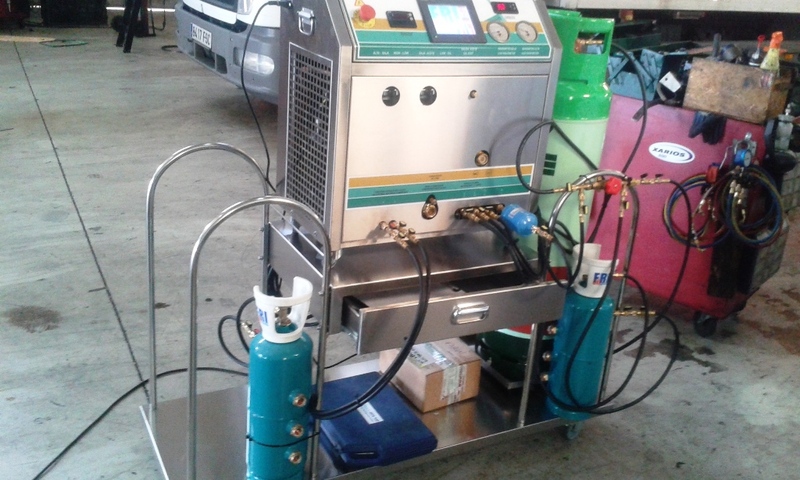 in addition, is ideal for the recovery and cleanup “in situ” of all refrigerants, with a very interesting capacity of decanting: it is able to move more than 115kg / hour of R-22. This circumstance makes Fri3Oil System perfect for retrofits facilities with mineral oil, MO, a POE oil, with HFCs. That is commonly called retrofit. Fri3Oil System has received major international awards demonstrating that it is an innovative and unique product in the market worldwide. Enables: Quick and effective on site cleaning of systems following burn-out or breakdown. 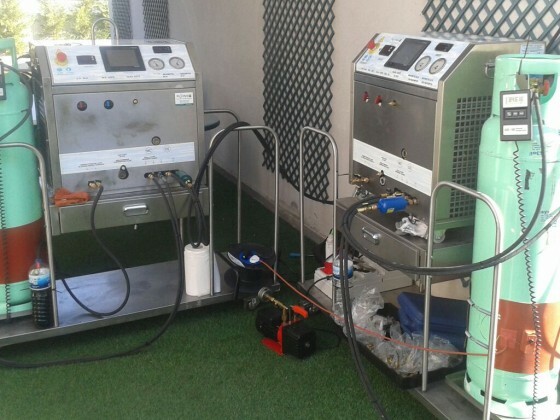 Improves: The performance and operating performance of refrigeration plant, reducing running costs. Extends: The life of plant by removing harmful contents. 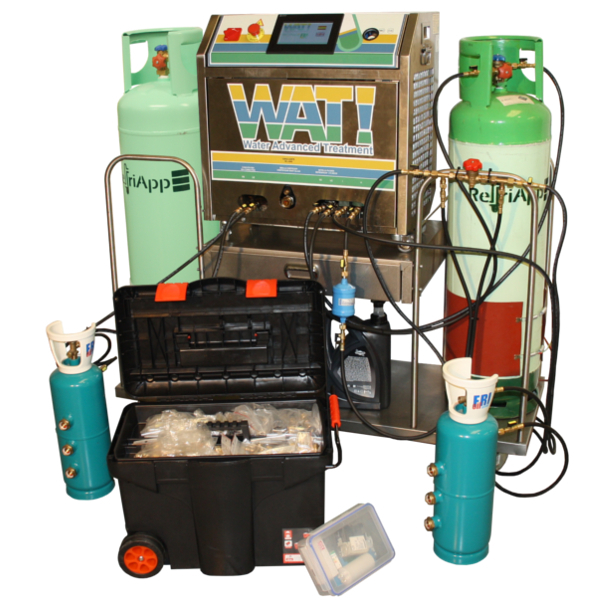 Avoids: Costly refrigerant disposal by incineration. Overcomes: The need to use solvents or cleaning agents to clean systems, by using the refrigerant itself as the cleaning medium. Shortens: The time required to carry out remedial maintenance to return the system to full operating performance and efficiency. Refrigerants recycling quality is less than 150 ppm for HFC’s and less than 600 ppm for HCFC’s. The system cleans any residues, impurities and contamination from any RAC plant. Transfer capacity corresponds to the values expressed herein. 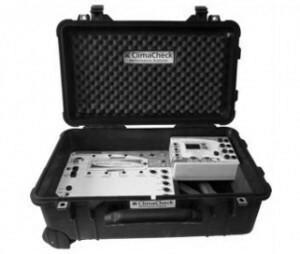 Safety CE Marking, endorsed by Spanish Notified Body ECA 0056, Madrid and Spanish Patent 2005 registered by OEPM. You can see, by clicking on the next tabs, the main technical and operational specifications of Fri3Oil System. Valid for use in all Refrigeration and Air Conditioning systems. 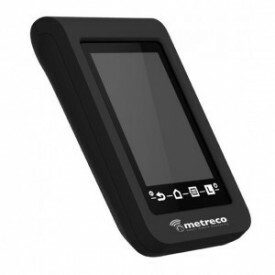 Suitable for fixed and mobile equipment. 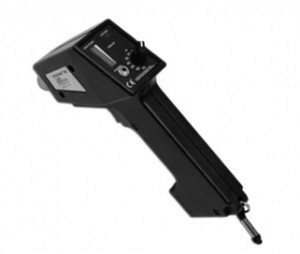 Valid for large, medium and small size equipment. High speed recovery and recycling of all halocarbon refrigerants: CFC’s, HCFC’s and HFC’s. System cleansing following a compressor motor burnout. Total elimination of system acidty. 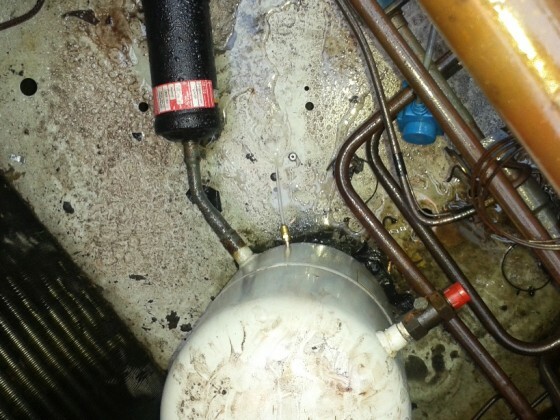 Dewatering installations where a heat exchanger communicates. 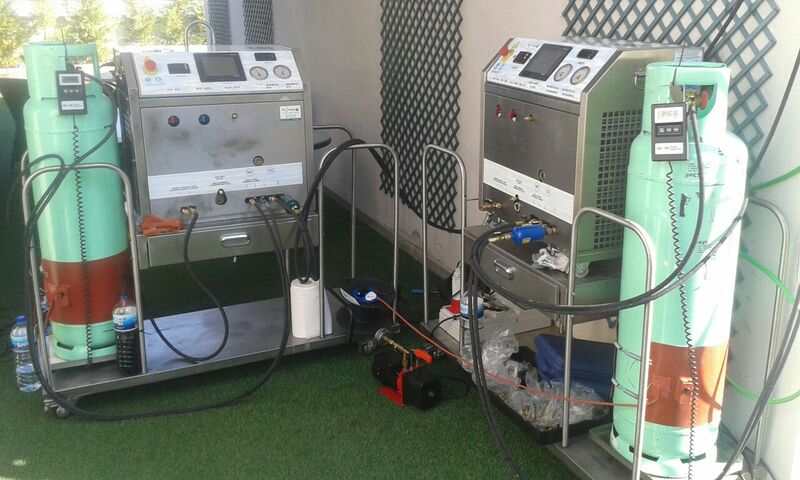 Conversion equipment to HCFC and HFC refrigerants MO and POE. Pipes internal cleaning of solid particles from welding without inert atmosphere. Optimization of refrigeration systems in CAP and COP. 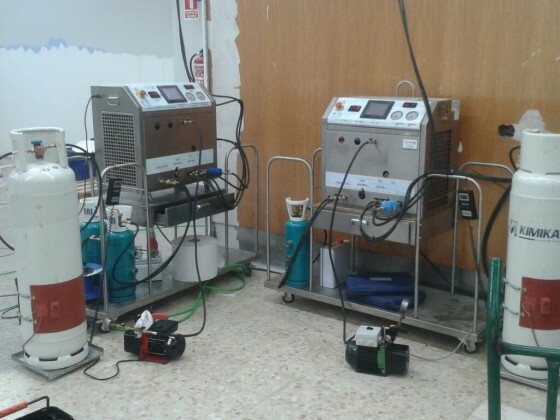 Decontamination and recycling of equipment that it will be obsolete. Suitable for VRV/VRF, Chillers, Supermarkets / Hypermarkets, etc. Average pressure (R-12, R-134, etc. ): 75 kg / h. Approx. liquid phase. High pressure (R-22. R-404 AR-507, R-407C, etc.) 115 kg / h approx. liquid phase. High pressure (R-410 A) of 135kg / h. Approx. 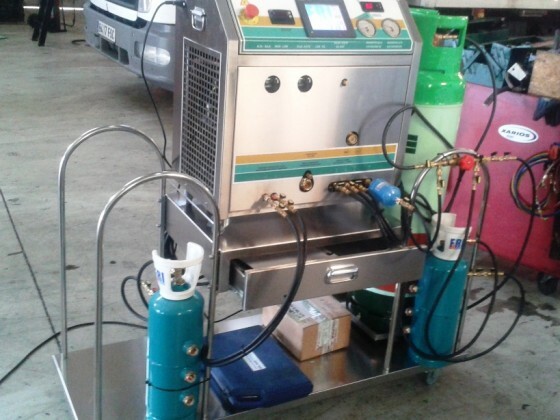 It uses the same refrigerant that exists in refrigeration systems to remove all oil. After removing these oils, the unit has a liquid separator inside to recycle the refrigerant that is mixed with these substances. Air Condenser copper tube, Aluminium wing. Frame: galvanized steel sheet. Machine Command: PLC and touch screen. 20 languages. Electric board: 1st quality products. Total recquired power: 2Kw. Single phase. 220V. AC. 50Hz/60Hz. Compressor: Rotary. Valid for all halocarbon gases. Temperatures: Thermostat and compressor discharge temp. Solenoid valve group: 1/4″ 3/8″. Portability: 4 wheels, 2 handles. Miscibility / refrigerant solubility with oil and of course with acid. Settling density of the refrigerant / water / oil-acid and acid pressure drag. Liquids separation by refrigerants evaporation. 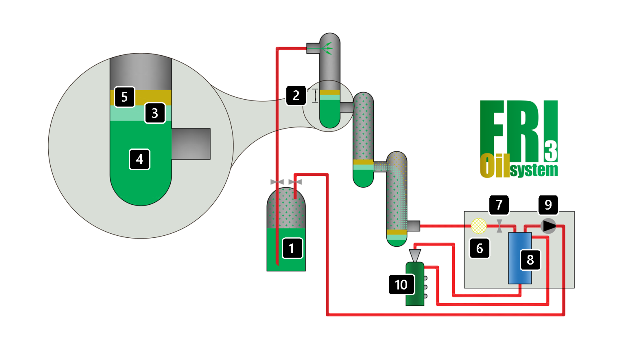 Other physical principles occur in the process, like the pressure differential between injection and suction. Meet all our international distributors and contact us if you want to become one of them. See the FAQs about Fri3Oil System WAT! 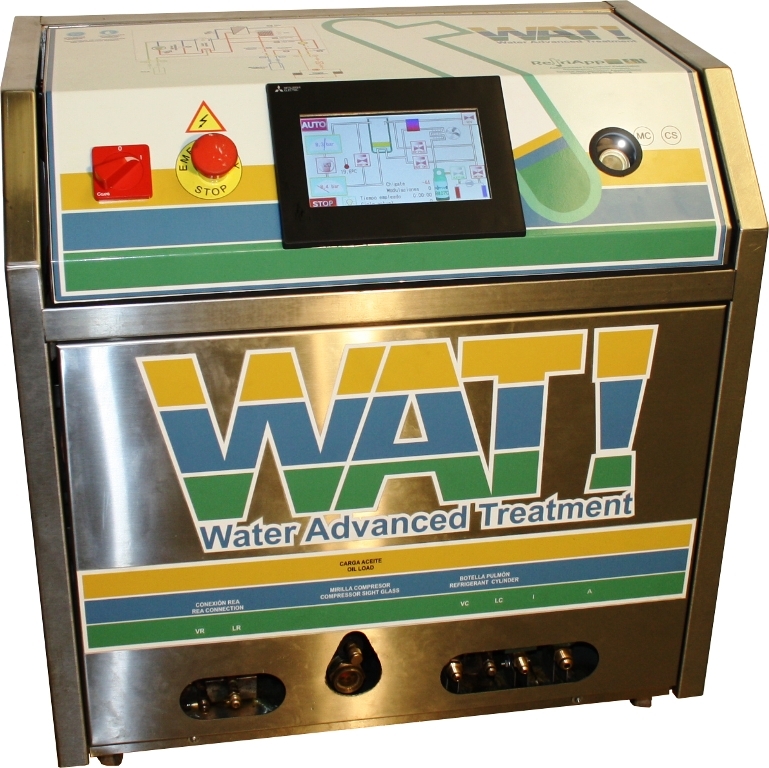 Download technical and commercial info about Fri3Oil System WAT!